Home Costs > How Much Does a Tray Ceiling Cost? How Much Does a Tray Ceiling Cost? With its raised center, a tray ceiling, resembling the look of an upside-down tray, offers the illusion of height and space are often found in the master bedroom or kitchen. Creating and/or installing a tray ceiling can be a significant expense and has to be done with precision in order to achieve maximum results. On average, plan on budgeting at least $2 to $6 per square foot to have a tray ceiling professionally installed. The costs depending on the number of tiers, the shapes, angles and curves, where you live and the contractor you’re working with. These costs can be much cheaper, near the lower end, if the ceiling is going to be installed during the new build process. For a standard room, plan on spending around $800 to $1,500 during a build, but if your home has already been built, then it’s safe to double these numbers to add a tray ceiling. Because all jobs are going to be 100% unique, it’s hard to offer an exact estimate, but there’s good news. If you use HomeAdvisor.com, you can receive exact estimates from local, reputable contractors for free. All you need to do is explain your job and you just sit back and watch the estimates come in. According to the builder, Stanton Homes, tray ceilings, as an upgrade, can cost around $1,000 for a very simple cut-out tray with no crown molding and no paint variation added. A tray ceiling is an architectural feature designed to “step up” in the middle and create a higher ceiling. It can either be dropped or raised depending on the height of the ceiling and what’s above the room being worked on. Shaped in the form of a tray, this type of ceiling can have a depth of at least six inches to a foot or more. It can have a vertical or angled design and can come with a series of steps. If your home has already been built, then the contractor will have to build mounted edges because the ceiling won’t be able to be raised unless you have a higher-than-average ceiling height or it’s done on the second floor. The top floor, unlike the ground floor, will have an attic access, which allows a contractor to tap into and raise the ceiling. After the tray ceiling is installed, it can be trimmed with two-level crown moldings. The recessed portion can be painted a different color and tray ceiling lights in the recessed area can be added to enhance the aesthetic appeal. These types of ceilings are often found in the master bedroom or dining room in most homes. LED rope lights are often installed along the border of a tray ceiling and may not be included in the initial quote. 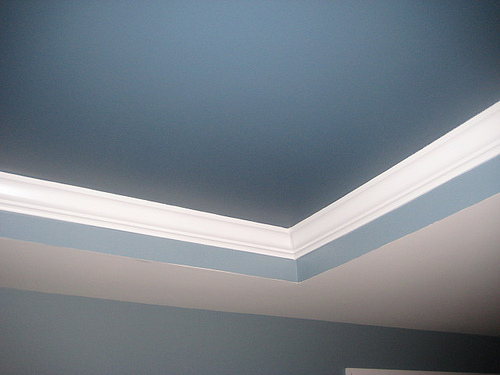 As mentioned, crown molding is often installed after the ceiling has been installed to enhance the aesthetic appeal. Depending on the material the crown molding is made of, this can increase the costs as well. Painting, after the ceiling has been installed, won’t often be included in the quote. This project isn’t recommended for those who have ceilings less than 10 feet tall because it will create an illusion of an even smaller ceiling. If you’re thinking about a tray ceiling, Pinterest.com has hundreds of pictures from those who did install one inside their home. What’s the difference between a tray ceiling and coffered ceiling? To put it simply, a tray ceiling is one large recess, often rectangular in shape, in the ceiling, whereas a coffered ceiling is a series of sunken panels. With any construction project, it’s always best to get at least three to five quotes before proceeding. While you don’t want to focus on the price, you will want to pay close attention to their reputation, past work and reviews online. A good contractor will be more than happy to come to your location and offer you a free estimate.